When dining alone, can you be carnivorous? 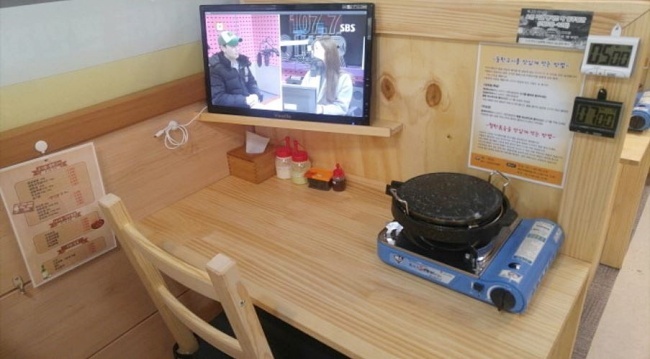 She visited a gopchang restaurant by herself and devoured the dish of cow’s small intestines. The very next day, people lined up in front of the featured eatery, waiting for two to three hours. Sales also soared at other gopchang restaurants across the nation. In reality, however, eating gopchang alone is not easy. Most of the people who lined up to have gopchang came in groups of two or three. Many barbecue restaurants sell dishes for a minimum of two people. Even Hwasa had to order gopchang for two, though she was alone. There are some places, however, that offer the pleasure of grilling meat alone, with just the right amount of meat and without the unwanted attention. Hongo in the Haebangchon area, central Seoul, is one such restaurant. Two friends, Hyun Geun-cheol and Son Eun-jung, run the restaurant, whose name is an abbreviation of “eating meat alone” in Korean. 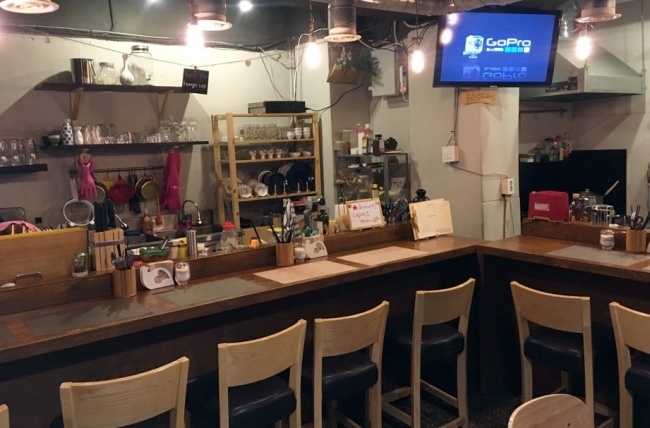 In 2016, Hyun and Son opened Hongo, setting up a comfortable atmosphere for solo diners, with bar tables and individual grills. More than 30 percent of its customers come alone. “They are usually people living alone in the neighborhood. We even created a membership day, inviting regular customers for a day out with us. We went to the Han River Park last month. It’s a process of becoming friends,” Hyun said. But not all solo diners want friendly conversation or interaction. A large number of people visit for some “alone time” as well. Right after ordering, they plug in to the video world with their earphones on. While the restaurant has two four-person tables, its main seating area comprises two long bar tables that can seat 10 people at the same time, shoulder to shoulder. “I first thought if a lot of solo diners visit, we wouldn’t be able to receive guests that come in two or three -- possibly losing guests. But I was wrong. People who come alone fill up empty spaces in between groups, making us more profitable,” Hyun said. 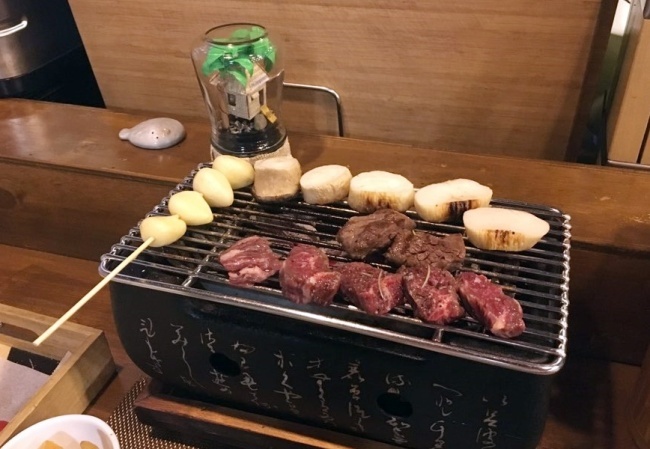 An order of grilled beef consisting of around 150 grams of meat costs between 15,000 ($13) to 20,000 won at Hongo. 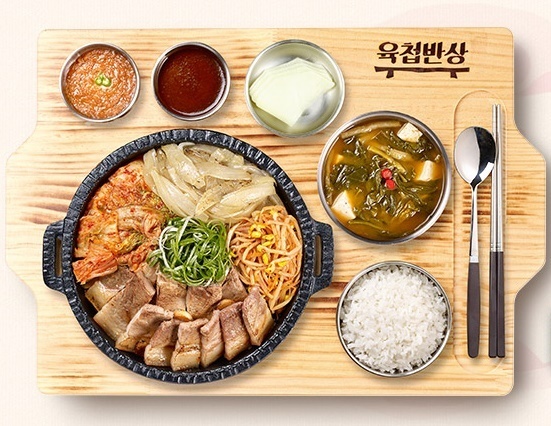 With some rice, soup and grilled vegetables, a meal for a single person would range between 25,000 won to 50,000 won. Here is a list of three more restaurants in and out of Seoul where solo eaters who want to enjoy meat alone will not be out of place. 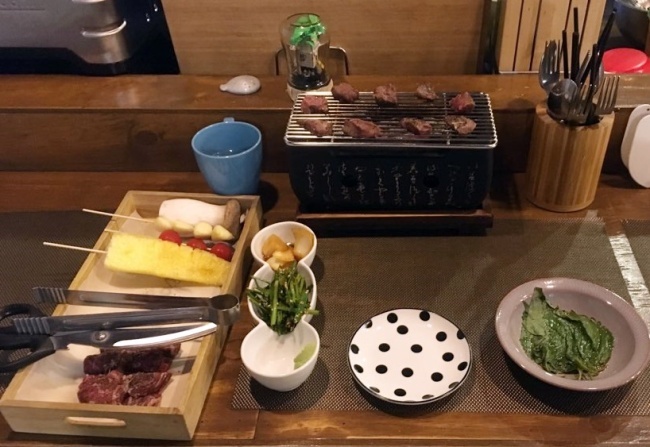 Solo eaters who want to be cut off from the world are welcome at Dokgojin, a grilled meat restaurant. At Dokgojin, seats are separated by partitions, preventing any unwanted eye contact. Each table is equipped with a TV, a charger and an individual grill. Around 150 grams of samgyeopsal (grilled pork belly) costs 11,000 won. Eating bossam, napa wraps with pork, alone is challenging as many bossam places don’t have serving sizes for one person. The dish is usually served in portions for two or three people. But Master of Fight offers bossam set menus for a single person under 10,000 won. Bar table seats are available. Those who want to drink solo with bossam can order 100 milliliters of Japanese sake for 2,000 won. Gwanak-gu is heavily populated by one-person households. Still, some might be uncomfortable with grilling alone, because it takes time. For these people, Meat Table serves grilled meat. 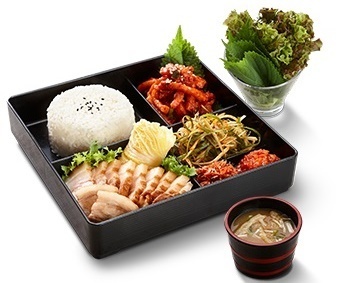 Set menus for a single person, including meat, vegetable and rice, cost under 10,000 won.